Since 1976, our family owned and operated 5-Star Oceanfront RV Resort has been THE go-to camping destination on the Crystal Coast. Located at 9102 Coast Guard Road, Emerald Isle, NC, our resort features 312 clean, grassy sites. We compliment our beautiful oceanfront RV resort with friendly staff, security, cleanliness and multiple camping amenities. Our number one priority is YOU, our camping guests, and we strive our best to ensure that you enjoy your stay. Our RV resort can accommodate most RV’s up to 60 feet as well as most sized Camping Clubs. We offer both full-hookup sites as well as sites with only water and electric service. From the moment you arrive, you will be tended to by our courteous staff and will be escorted to your assigned site from the front gate. We are always available to assist you with any issue that may arise during your stay, and will see to it that you are taken care of until your departure. The Holiday Trav-L-Park Resort has been rated one of the best RV resorts for camping in the USA due to our ability to provide security, hospitable staff, clean campsites, clean restrooms and much more. Our goal is for you, your friends, and your family to have THE MOST MEMORABLE camping experience EVER. We hope that your next camping trip will be with us so that you get to experience oceanfront camping on the Crystal Coast like never before! No. There is no way to make reservations online. We prefer to handle all reservations over the phone in order to establish a personal point of contact and answer any questions or concerns that may arise. Please call the resort office at (252) 354-2250 for more reservation information. Do you have campers for rent? Yes! You can rent a camper from a gentleman named Jim Rogers. His phone number is (252)-531-5872. Jim has campers available for rent all year round. You will make your reservation through him and he will handle the rest with us. You still have to stop in the Resort Office when you arrive to check-in. We open the resort at the beginning of March for seasonal campers and open mid-March for overnight campers. We close down the resort for everyone at the very beginning of December. Do you have pull-thru sites? Yes! The majority of our campsites are pull-through. After checking in at the Resort Office, you will directed towards the Front Gate where you will be escorted to your assigned site by our friendly park staff. If you need any assistance during check-in or during your stay, they are always willing to assist you! Check-In and Check-Out time vary depending on the time of year. Peak Season (May 31st – September 2nd): Check-In time is 2:00 PM and Check-Out time is 12:00 PM (Noon). 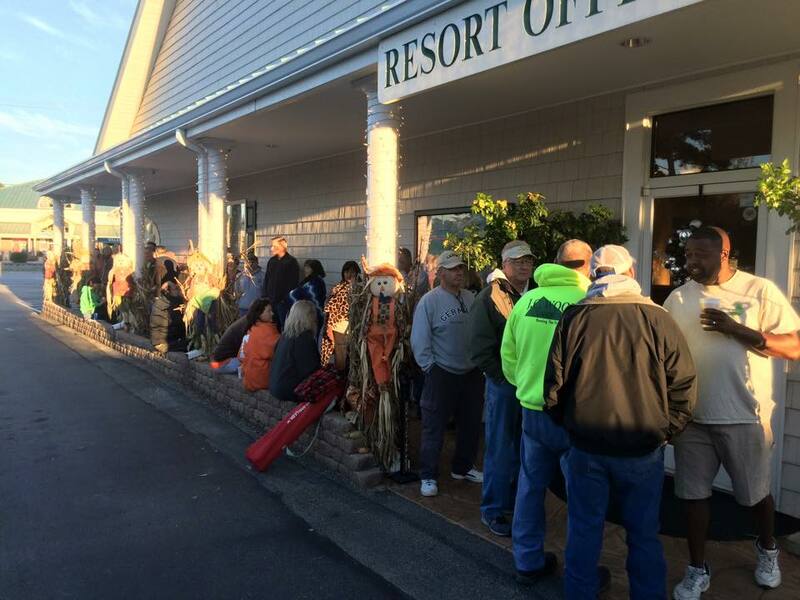 Off Season: Check-In is at any time (as long as your reserved site is open) and Check-Out time is 2:00 PM. If you’d like, you can call ahead to check if your site will be available for early check-in or late check-out. There will be a $10 fee per-hour for early Check-In and/or late Check-Out from May 31st – September 2nd. When can I start making reservations for next year? HallowScream Weekend is the first time we start taking reservations for the following year. Everyone that camps with us for that fun-filled weekend has the ability to come in the Resort Office and book their sites on Saturday, October 27th, 2018. For everyone that can’t camp that weekend, we open up the phone lines on Sunday morning, October 29th, 2018. Here is a photo of our campers waiting to reserve for the upcoming year! Where is the Holiday Trav-L-Park Resort located? Our Resort is located in Emerald Isle, North Carolina. Emerald Isle is considered the southern most tip of the Outer Banks (otherwise known as the Crystal Coast). It’s part of the same Barrier Island that makes up Atlantic Beach, Indian Beach, Pine Knoll Shores, and Salter Path. See our Contact Page for an aerial map of the park and surrounding area. Yes! We offer storage for campers, boats, golf carts, utility trailers, and anything else that will fit on our lot. Storage can be for as short or as long of a period as you’d like. For those of you who want to store your camper, our Park Staff will pull it onto your reserved site the day of your reservation and pull it off when you’re done. See the Storage Rates Page or call us for information and pricing. Yes! We do allow both electric and gas golf carts. We just ask you abide by our Golf Cart Rules. All golf carts must have a valid parking pass in order to enter the resort and park on the premises. Passes can be obtained in the Resort Office. Golf Cart Passes are $5.00 per day, $25.00 for the week, or $50.00 for the season. If you bring your own golf cart, we require proof of insurance at the time of check-in. We will make a copy to have for our records. No proof of insurance is required for rented golf carts. Fire-pits must be well-contained and stand at least 2 feet off of the ground. However, ground fires are prohibited on campsites. Firewood bundles are normally available for purchase at the Emerald Isle Wine Market; our convenience store located right beside our Resort Office. Yes! We do allow pets at our resort. We just ask you abide by our Pet Policy. Do you have worship services? Yes! We have worship services every Sunday from May 13th, 2018 to September 30, 2018. 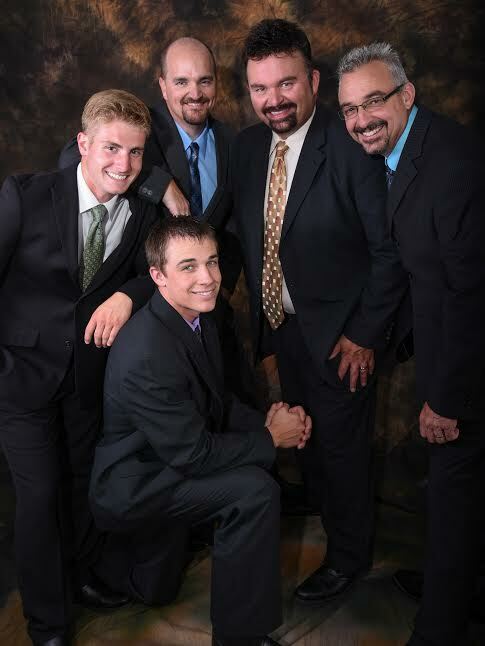 Curtis Hyler and Jubilation, a wonderful quartet that showcases the pure and southern sounds of Gospel music, provide the Holiday Trav-L-Park Resort with church services each Sunday. Services are held at the stage area starting at 9:00 AM and are open to the public. Yes! We have FREE BASIC WiFi available throughout the Resort. Is there Cable TV available? Yes! Cable TV is available on all sites and is included in the nightly rate. Our cable is Analog, not Digital, so you are able to chose from around 60+ channels. Please bring your own Coaxial Cable if you plan on using cable. If you do not have one, they are sold in the Resort Office. What does the *(asterisk) mean on the Resort Map? The *(asterisk) on the Resort Map indicates that 50 AMP electric service is available. Both 30 AMP and 50 AMP service is available on campsites with the *(asterisk). If you wish to use the 50 AMP electrical service on these campsites, there is an additional charge of $5.00 per night. Please inform the Resort Office of the kind of electrical service you will need at the time of reservation and check-in.